Why do people get into public service? Earlier today, I was watching video of President Barack Obama talking to his campaign workers, getting all teary eyed. He described how he moved to Chicago and started helping out however he could, and applauded those who have given their lives for something more than themselves. I have to shamefully admit that for part of the time watching this video, I was thinking “Why would somebody do that to themselves?” It’s so much work, and for what? For the chance to have half the country think you’re a socialist, America-hating buffoon? I mean, look, I understand why people want to help people. I’m not a sociopath. But I do think that the drive to look outward stems, at least partially, from some sort of anxiety or fear of looking inward. To be fair, there’s a beauty to that. I can be particularly empathetic to a friend in need when I’ve experienced something similar, for example. Or perhaps there are parents who instill a real sense of charity and humility in their children in a very genuine way. I’m just saying it’s possible that public service can be emotionally masochistic in a way that would drive away only the most foolhardy of us all. And that foolhardiness has to come from somewhere. It’s understandable, then, that he’d be especially prickly at the prospect of bringing his parents together on this particular night. He’d just left a job in Washington DC, a place far away from Minnesota, and one demanding enough to consume his every waking moment. On the down side, there was less time for Leslie Knope, the world’s most quilt-devoted person—which is I guess Ben’s big turn-on. On the plus side, his parents lived far away in what might as well have been a fictional place and time! Until now. This engagement party is a big moment for Ben. He is finally stable enough with his life that he can tell his parents exactly how he feels, and he has someone by his side who will chide him until he does. And in the moment when it’s needed most, Ben, the Captain of Gondor, shows his quality (to quote Lord Of The Rings, which is kind of like Game Of Thrones… making a stretch based on the fact that I rewatched Return Of The King today). He lays the smack down in no uncertain terms. It’s glorious to watch. And this was after a comical run of terrible tidings from mom and dad. They visibly shudder when they see each other. Ulani, dad’s young girlfriend played by Who Charted?’s Kulap Vilaysack, demands to know why she doesn’t have a square on Leslie’s unity quilt, which leads to Leslie slapping one on. Which leads to mom cutting off a square. Which then leads to Ulani revealing she’s pregnant. Leslie’s mom has been a bit of a beast before, but she’s a freakin’ saint in comparison tonight. Meanwhile, we get a glimpse at another textbook “I help others to overcompensate for my inability to help myself” story in Chris. His therapy has opened the floodgates of his emotions and of the actual production of tears, and he realizes just how alone he really is. How all his fitness thingies and organic soy doohickeys can never fill whatever void’s in his heart. He even tries to pick up residual void-fillings by walking around with Ben and Leslie as they announce their engagement… for a second time, asking everyone to fake for Chris’ benefit. At least now that Chris has acknowledged his faults (and everyone else has born witness to them), he can change. Ben did. But Jean-Ralphio will never change. He’ll always shirk responsibility for faux-panache. The entire foundation of Entertainment 720 shows that off in spades. And neither, of course, will Ron Swanson. He needs a solid presentation; he won’t be impressed with flashy lights and disco balls. He invests his money in gold. Gold. Like an old timey panhandler with one tooth. That guy would hate Jean-Ralphio. Ron Swanson merely despises him. Tom realizes he’s in this alone, so he ditches Jean-Ralphio, an action which is more than enough proof to Ron that Tom’s serious about his Rent-A-Swag business. 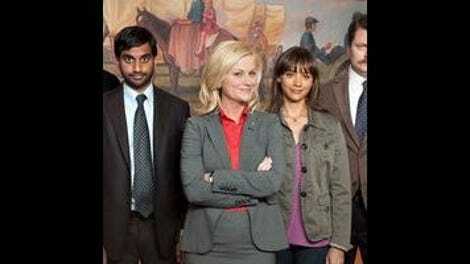 The characters on Parks And Recreation didn’t just appear out of thin air. They came from somewhere, and the writers have a real sense of their roots both superficial and psychological. Ben has two parents; yes the math adds up. They also distinctly contributed to his personality and love of public service. I’m sure there’s a really good reason Andy loves Dave Matthews Band, Leslie and Ben seem to never get beyond first base, and Jean-Ralphio is totally cool being [sung] “technically homeless.” Whatever the reason, I trust these guys that it’ll make perfect sense.